Launched in October 2018 I have finally had a chance to test the new TP-Link Deco P7 Hybrid Mesh system that uses powerline to establish a connection between the satellites. The sample I was sent is a two satellite system, but you can expand it as much as you want, and you can also mix and match products, so you could potentially upgrade the system to the M9 in the future, using these as satellites in the less important areas, or there is the TP-Link Deco M5 which can be bought as one unit for £69.99. Most of the Deco systems have a similar design opting for a disc rather than a cylinder or other shapes. Each disc has two ethernet ports, and they all can be used as either the primary router or satellite. You get all the usual features of a router, this includes things like DHCP, port forwarding, address reservation, QOS and even some basic VLAN features. On top of this, the system comes with an Antivirus built in, something that has become increasingly popular in recent years, so all your home security is done at router level rather than relying on software on your PC/Laptop. If you already have a router and want to continue using it, you can switch to access point mode which will disable most of the advanced router features. Furthermore, if the powerline isn’t quite good enough for you, you can use ethernet backhaul to achieve that maximum possible speeds between devices. In terms of the hardware specifics, the P7 comes with a quad-core Qualcomm Atheros IPQ4019 chipset, 32MB of flash memory (WINBOND 25Q256JVFQ), 256 MB of RAM and two U&T UTG24P05 1814T 100/1000M Base Single & Dual Port Transformers. The units also comes equipped with a CSR 8811 A12U 80GN5N Bluetooth 4.2 chip. The Deco P7 is also compatible with IFTTT and Alexa, making it a bit easier to control the devices on your network. With IFTTT you can have it do things like send an email when a new device connects. Setting up the Deco P7 was one of the easiest Mesh systems I have used. I didn’t follow the instructions exactly, but that didn’t appear to bother it. As always you will need to download the dedicated Deco app, sign up and then start the set-up process. Unlike Orbi, these are not pre-paired but adding each disk to the system is very quick. These are the first networking product that I have used that uses USB-C for the power, the plug sockets provided will be an essential part of the powerline connection so you should always use this, but in theory you could get them powered up without powerline using a regular USB-C cable and adaptor (I have not tested this). The app uses Bluetooth to detect the Deco and pair then from there you follow the basic instructions such as assigning an SSID and password. Once the first Deco is paired, you can continue to add more. The app advises you to disconnect the router handling your Internet, but I was too lazy to get up and do this so just risked it, and it worked without an issue. This system does not appear to have a web interface, which I normally prefer when it comes to managing a network, but thankfully, due to the simplicity of set up, I didn’t miss it. 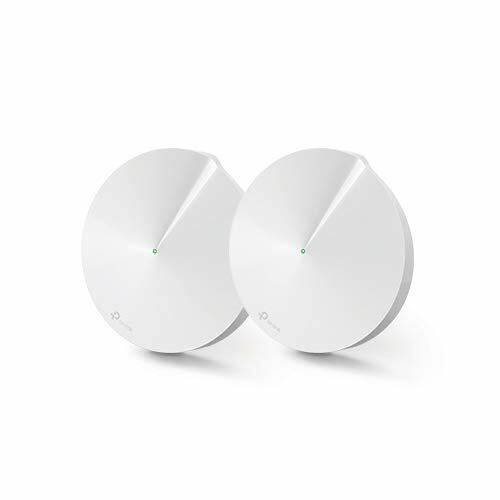 The TP-Link uses all three forms of backhaul ensuring you can connect each satellite. The preference of the units is Ethernet first, then powerline, and finally Wi-Fi. Wi-Fi is important as some homes may not have the same ring circuit for all the sockets, and if this is the case, the powerline wouldn’t work. Most of my testing was done using the default powerline connection. I have had mixed results getting it to work on Netgear Orbi, and with the TP-Link, it isn’t very clear if Ethernet backhaul is enabled when wired up, from my testing it appears that the LED on top of the Deco will blink red then go back to green when you plug an Ethernet cable in. I noticed significant speed improvements so it was clearly working. Things did not go quite as well when I located the satellite in my main TV room, where the other RBK20 is located. With the powerline connection, the speeds dropped down to around 90Mbps on Virgin and similar for the internal test. Clearly the quality of the internal wiring will be affecting the performance. Switching to Ethernet completely changes the results again. The Deco connects to Ethernet within a few seconds, and as you would expect, once on ethernet, it has identical results to the primary router, achieving peak internal speeds of over 630Mbps. Netgear Orbi can also connect via Ethernet, but I have had a lot of issues with getting it connected, in particular, it does not like having to go through multiple switches. While some of the results have been a little mixed, the TP-Link Deco P7 is a very appealing mesh system and depending on your home and usage you could get superb performance out of it. An older home may not get the best performance out of the powerline, but it does offer considerably more flexibility in positioning than its Wi-Fi backhaul counterparts. If for some reason you need to place the units a significant distance apart, this is the system to go for. Most consumers just want to get reliable Internet throughout the home, and this system was able to achieve this regardless of the backhaul used. With a reliable connection to the primary or satellite router, performance is superb, just as good as competing brands and I would say punching well above its price point. I have also found this to be one of the best systems to date for using an Ethernet backhaul, and once this is established the performance across all the satellites is superb. I also found it particularly easy to set up which is always a bonus.